In this post, I will make a short statistical presentation of five players from the Nigeria Premier League 2012. I believe all players could be heading for good careers in football. 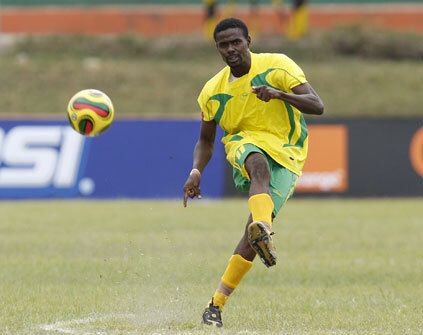 Brilliant playmaker Rabiu Ali has already scored six league goals during the Nigeria Premier League 2012. Ali is an expert at set-pieces and could very well reach double figures this season. The picture of Ali is taken from MTN Football. Emmanuel Enize is the captain of Ocean Boys FC. The lively striker looks set for his best season ever in terms of goals. At the time of writing, Enize has scored four times during the Nigeria Premier League 2012. Bala Mohammed has been a revelation at Jigawa Golden Stars FC, scoring six goals so far during the Nigeria Premier League 2012. Mohammed is a hard worker who used to captain Kano Pillars FC before be fell out of favour because of injuries. Oduokpe Oghogho, sometimes referred to as “Raul”, is an energetic and talented striker who signed for Rangers International FC in February 2012. Oghogho has already scored his first goal for his new club. Uche Ossai is a tough midfielder with a bright future in football. Ossai has scored his two first league goals during the Nigeria Premier League 2012.